Hopewell Theater is proud to announce our very own Summer Stars theater camp! 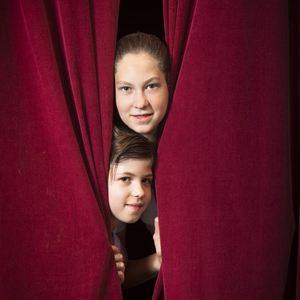 Kids from 1st through 7th grade are invited to attend afternoons that will be filled with fun, hands-on theater arts activities that explore character, movement, costuming, and backstage jobs. No prior experience in theater or stage is required! The program will lead up to and prepare campers for the final big show at the end of camp, the “Showcase” where every camper will have a part, performed at Hopewell Theater. As an added bonus, campers will also have the opportunity to “meet-the-actors” after HT’s children’s theater production of My Mother, The Astronaut the week of camp! Each day of camp will begin at 1:30 pm, with a late-afternoon snack and supplies provided and included in registration cost, and pick up time will be between 5 pm – 5:30 pm. The late- afternoon snack will be provided in standard and vegetarian options each camp day for every registered camper. All late afternoon snacks will also not contain any nuts. The camp will start on Monday, July 8th, and will conclude with the Summer Stars showcase at 4:30 pm on Friday, July 19. We’re very fortunate to have HT’s own Ashley Layton directing the summer camp! Ashley currently curates the programming at Hopewell Theater, as program manager, but she was also the Director of Branchburg Township’s Creative Theater program for 5 years, working with children ages 6 to 14, after serving as Assistant Director for 5 years. During her tenure running the Creative Theater program, she wrote, directed, designed and stage managed every production. In 2014, she co-founded the non-profit theater company, The Igloo Collective, which focuses on using theater to connect communities and ignite change; she is currently President of the Board of Directors. Ashley received her theater training at The New School in New York City and we couldn’t be more excited about having her run this program. If you’re interested in signing your child up for our Summer Stars Theater Camp, then you can do so here. Don’t delay and we welcome calls to our Box Office with any questions!